As the owner of DecorativeDishes.net I normally I HATE seeing broken dishes because it means something went wrong, but this is a very striking piece of art. I saw it on Pinterest so I don't know the origin (if anyone does please tell me so I can credit it). 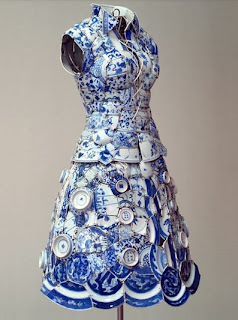 A very clever artist has created a a mosaic dress from Blue and White China Dishes. 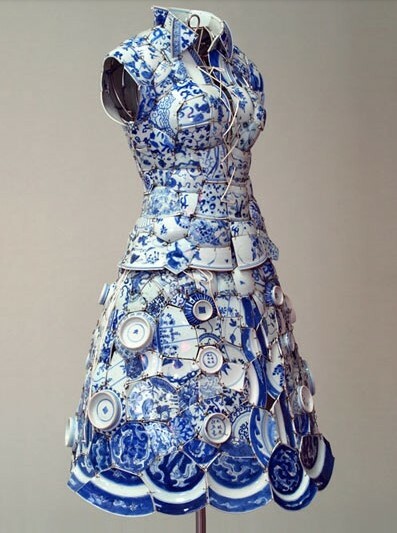 While the piece itself is very eye catching it really brings home the beauty of blue and white decorative plates in that the artist made a "fabric" out of them. I love it! 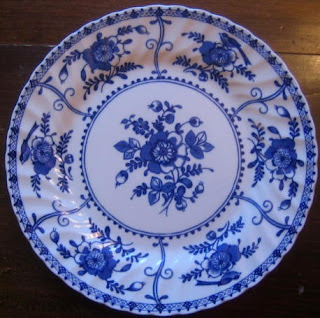 While I don't know how you could make such an intricate and beautiful dish dress, if you like the color and style I have lots of blue decorative dishes in my boutique DecorativeDishes.net .